Dudjom Tersar (Tib. བདུད་འཇོམས་གཏེར་གསར་, Wyl. 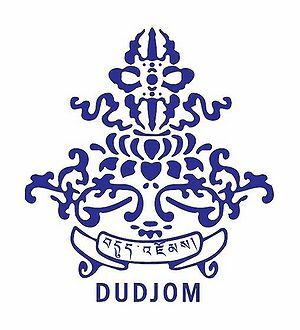 bdud 'joms gter gsar), 'The New Treasures of Dudjom', is the combined collection of termas revealed by Dudjom Lingpa (1835-1904) and Dudjom Rinpoche (1904-1987). Along with the Longchen Nyingtik, the Dudjom Tersar has become among the most widespread and practised terma cycles among Nyingmapas, both monastic and lay practitioners. Among its vast scope of practices, the Chö of the Tröma Nakmo cycle is being especially and widely practised by the Dudjom Tersar practitioners. During the time of Dudjom Lingpa, the Dudjom Tersar lineage was spread mainly within the Golok (Amdo) and the Kham regions of Tibet. Later, during the first part of the 20th century, Dudjom Rinpoche spread it in Khorlo Dratsang , in Pemakö where he was born, and later in Lama Ling, his seat in the Southern part of Tibet. From 1959 onward, Dudjom Rinpoche propagated the Dudjom Tersar first in India and all the regions and kingdoms of the Himalayas (Bhutan, Sikhim, …), then in Europe, in the USA, and in Eastern Asia. The name Dudjom Tersar means ‘The New Treasures of Dudjom’, in the sense of the recent lineage, as opposed to older lineages of termas. It was predicted by Urgyen Dechen Lingpa that: "In the future in Tibet, on the east of the Nine-Peaked Mountain, in the sacred Buddhafield of the self-originated Vajravarahi, there will be an emanation of Drogben, of royal lineage, named Jnana. His beneficial activities are in accord with the Vajrayana although he conducts himself differently, unexpectedly, as a little boy with astonishing intelligence. He will either discover new Terma or preserve the old Terma. Whoever has connections with him will be taken to Ngayab Ling (Zangdok Palri)." The tantras, practices and other texts of the Dudjom Tersar were discovered as termas by two masters: Dudjom Lingpa and by Dudjom Rinpoche. In 1858, at the age of 23, Dudjom Lingpa migrated from his native home of the Lower Ser Valley to the Mar Valley, close to Mardo Tashi Chöling Monastery. He stayed there for a long time under the patronage of the Gili family, and so he became popularly known as the ‘Gili Tertön’. Then, in 1860, at the age of 25, Dudjom Lingpa revealed from among the rocks of Ba-ter of the Mar Valley his khajang, his “prophetic guide" which had all the instructions on how and when he should discover and reveal his own termas cycles. In the same year, with the guidance from the khajang, Dudjom Lingpa started to discover and reveal his own major Gongter from Ngala Tak-tse of the Ser Valley. Over the time, Dudjom Lingpa was to able to discover altogether twenty volumes of termas, Gongter and Sater. Born in 1904, it was said by a senior student of Dudjom Lingpa that Dudjom Rinpoche began to reveal termas from the age of 8. Later, Dudjom Rinpoche went to a secret place called Kenpa Jong (or Phuntsok Gatsel), and, practising the ‘Dudjom Namchak Pudri’, a Vajrakilaya sadhana discovered by Dudjom Lingpa, he revealed his own cycle of terma of Vajrakilaya, the Pudri Rekpung. While he was practising a Dorje Drolö practice from Rigdzin Düddul Dorje, Dudjom Rinpoche discovered his own Dudjom Dorje Drolö as a gongter. Dudjom Rinpoche also revealed the Tsokyi Tuktik, and the Khandro Tuktik. “The Dudjom Tersar lineage is fresh, vivid, direct, and with no loss of meaning, words or blessing. These teachings, coming from Guru Rinpoche to Dudjom Rinpoche, and then to us, is a direct short lineage. Therefore, because this lineage is uncontaminated and knows no degeneration by broken samayas, the blessing and attainments are immediate”. Another characteristic of the Dudjom Tersar is that its texts and practices being concise, direct and very precise, they are well suited to a modern and contemporary world and life-style. During the time of Dudjom Lingpa, oral lineage stories — and prophecies included in the his biography — recount that “Through the practice of Tröma Nakmo, thirteen of Dudjom Lingpa’s disciples attained rainbow body, and one thousand reached the level of Vidyadhara”. During the 20th century, several direct students of Dudjom Rinpoche are reported to have achieve the rainbow body, among them are Khenpo Achö and Jigme Chöying Norbu. Ngöndro, with three main practices, the very brief Dudjom Tersar Ngöndro, the Khandro Tuktik Ngöndro and the Tröma Nakmo Ngöndro. Dzogchen, with the practices of Trekchö — on which the main instruction text is the Nang Jang — and Tögal. Traditionally, a student trains in a series of three Sadhanas known as the Three Roots, following the order of Lama, Yidam and then Khandro practise. But according to oral instructions from Dudjom Rinpoche, in order to remove obstacles on the path, to gather favorable circumstances and to accomplish all his aspirations, the practitioner of the Dudjom Tersar begins by the Yidam practice of Vajrakilaya, then the Lama practice, and then the Khandro practice . In English translation and regular paper format, each of these volumes would be between 700 and 800 pages. The total texts of the Dudjom Tersar would therefore amount to approximately 35,000 pages. Sherik Dorje Nӧnpo Gyü, the wisdom mind treasure of the Lord of the Dance, Traktung Dudjom Lingpa, who experienced Kuntuzangpo directly in a vision giving teachings and answering questions to his own emanation's retinue of bodhisattvas. Chime Soktik is the main longevity practice based on Amitayus in the Dudjom Tersar lineage. This practice was revealed by Surmang Namkhai Dorje for Dudjom Rinpoche's long life. Dechen Namrol is a Guru Rinpoche practice, similar to the Rigdzin Düpa. Tukdrub Terkha Dündü is a Guru Rinpoche guru yoga practice which combines seven lineages of terma. Both Dudjom Lingpa and Dudjom Rinpoche wrote many songs of realization. The Dudjom Tersar Places of Activity are located now in many different parts of the world. During the time of Jamyang Khyentse Wangpo and Jamgön Kongtrul Lodrö Tayé, Dudjom Lingpa was invited by his two famous contemporaries to include his new terma cycles into the Rinchen Terdzö, the "Precious Treasury of Terma" they were assembling. Oral lineage recounts that when asked, Dudjom Lingpa politely declined their kind offer by answering that "Wherever the Rinchen Terdzö will be spread, it will be the same with my Tersar". In the same manner, when Dudjom Rinpoche was eight years old, he began to study Shantideva's Bodhicharyavatara with his teacher Ling Lama Chöjor Gyatso. When they had completed the first chapter, his teacher presented him with a conch shell and asked him to blow it towards each of the four directions. The sound it made to the East and to the North was quite short, in the South it was long, and in the West longer still. This was to be an indication of where his work in later times would be most effective. During the time of Dudjom Lingpa, the Dudjom Tersar lineage was spread mainly within the Golok (Amdo) and the Kham regions of Tibet. Later, senior direct students of Dudjom Lingpa propagated the Dudjom Tersar lineage within Tibet, like Degyal Rinpoche establishing the Namkha Khyung Dzong in Western Tibet, Sera Khandro in Awo Sera Monastery. Later, during the first part of the 20th century, Dudjom Rinpoche spread it in Khorlo Dratsang in Pemakö where he was born, and later in Lama Ling, his seat in the Southern part of Tibet. From 1959 onward, Dudjom Rinpoche propagated the Dudjom Tersar first in India and all the regions and kingdoms of the Himalayas (Buthan, Sikhim, …), then in Europe, in the USA, and in Eastern Asia. ↑ The word “Tersar” is used with the same meaning as in the Chokling Tersar, “The New Treasures of Chokyur Dechen Lingpa’. ↑ Source : Shedup Kunsang web site.